I’m already on my 3rd Philips Sonicare toothbrush. It works much better than a manual toothbrush and gentler compared to the comparable Oral B toothbrush that I used. The Philips Sonicare Flexcare Premium Edition Toothbrush 2 Pack at Costco is a great deal. Compared to older models, you get the same patented Sonicare technology that delivers up to 31,000 strokes per minute, the Quadpacer interval timing that does a beep after brushing each quadrant to remind you to move on to the next one, and Smartimer that shuts the Philips Sonicare off after 2 minutes. 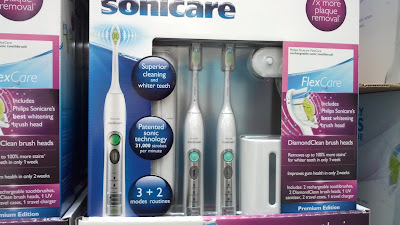 But in addition, the Philips Sonicare Flexcare Premium Edition Toothbrush 2 Pack adds some cool features like brushing modes depending on whether you want to do a normal brush, a massage brush, or a quick brush (for in between regular brushes). You'll be able to use the Sonicare with any toothpaste whether it's Colgate, Crest, Sensodyne, or Aquafresh. With the older models, battery life eventually dwindled to the point where the toothbrush would only accept enough charge to last one brush cycle. With this new model, I’m hoping that they improved on the battery life. For this price, you get 2 toothbrushes, 2 brush heads, a UV sanitizer and a travel charger. That’s a steal. Philips Sonicare Flexcare Premium Edition Toothbrush 2 Pack. Philips Sonicare Flexcare Premium Edition Toothbrush 2 Pack – For Whiter Teeth and Healthier Gums. 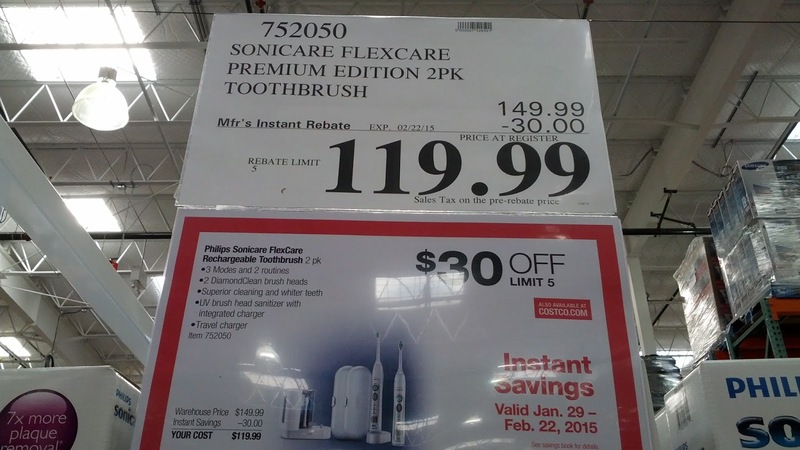 Philips Sonicare Flexcare Premium Edition Toothbrush 2 Pack. Patented Sonic Technology Sonicare's patented technology gives you results you can see, and a clean you can feel. Sonicare's patented sonic technology produces a dynamic cleaning action with 31,000 strokes per minute that thoroughly cleans your teeth and massages your gums, while still being remarkably gentle, even on sensitive teeth. The FlexCare is even gentle enough to be used by people with braces, dental restorations, and periodontal pockets. The FlexCare toothbrush features three flexible brushing modes so you can personalize your brushing and address your specific oral care needs. Clean mode is ideal for complete, whole-mouth cleaning. Massage mode improves gum health by stimulating gums with an invigorating and pulsing motion. Sensitive mode is extra gentle for new users or those with sensitive teeth and gums. You can also choose from two personalized cleaning routines: MaxCare, which delivers a 3-minute, thorough, full-mouth clean, and GoCare for a quick 1-minute clean between regular brushings. The Smartimer indicates that your brushing cycle is complete by automatically turning off the toothbrush at the end of the brushing cycle. The Quadpacer is a 30-second interval timer that has a short beep and pause to remind you to brush the 4 sections of your mouth evenly and thoroughly.